Recall that 3 or more lines are said to be concurrent if and only if they intersect at exactly one point. The angle bisectors of a triangle's 3 interior angles are all concurrent. Their point of concurrency is called the INCENTER of the triangle. In the applet below, point I is the triangle's INCENTER. Use the tools of GeoGebra in the applet below to complete the activity below the applet. Be sure to answer each question fully as you proceed. 1) In the applet above construct a line passing through I and is perpendicular to AB. 2) Use the Intersect tool to plot and label a point G where the line you constructed in (1) intersects AB. 3) Construct a line that passes through I and is perpendicular to BC. 4) Plot and label a point H where the line you constructed in (3) intersects BC. 5) Construct a line that passes through I and is perpendicular to AC. 6) Plot and label a point J where the line you constructed in (5) intersects AC. 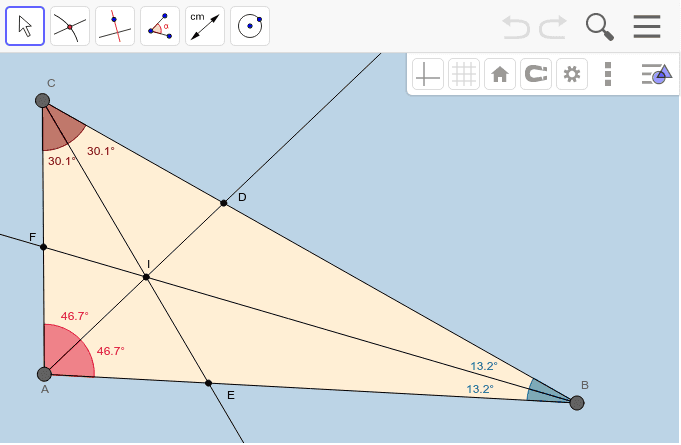 7) Now, use the Distance tool to measure and display the lengths IG, IH, and IJ. What do you notice? 8) Experiment a bit by moving any one (or more) of the triangle's vertices around Does your initial observation in (7) still hold true? Why is this? (If you need a hint, refer back to the worksheet found here﻿. 9) Construct a circle centered at I that passes through G. What else do you notice? Experiment by moving any one (or more) of the triangle's vertices around. This circle is said to be the triangle's incircle, or inscribed circle. It is the largest possible circle one can draw inside this triangle. Why, according to your results from (7) is this possible? 10) Do the angle bisectors of a triangle's interior angles also bisect the sides opposite theses angles? Use the Distance tool to help you answer this question. 11) Is it ever possible for a triangle's INCENTER to lie OUTSIDE the triangle? If so, under what condition(s) will this occur? 12) Is it ever possible for a triangle's INCENTER to lie ON the triangle itself? If so, under what condition(s) will this occur?